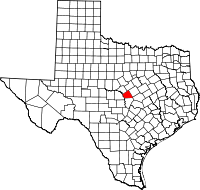 Lampasas County (/læmˈpæsəs/ lam-PASS-əs) is a county located on the Edwards Plateau in the U.S. state of Texas. As of the 2010 census, its population was 19,677. Its county seat is Lampasas. The county is named for the Lampasas River. The Lampasas County Courthouse was completed in 1884. The structure was added to the National Register of Historic Places on June 21, 1971. Lampasas County is part of the Killeen–Temple, TX Metropolitan Statistical Area. Indigenous peoples were the first inhabitants of the area. Later known tribes in the area included Tonkawa, Lipan Apache and Comanche. 1721 The Aguayo expedition is said to have passed through the county. 1853 Moses Hughes and his invalid wife, Hannah (Berry), became the first permanent settlers, seeking to take advantage of the medicinal springs. 1854 John Patterson was the first man to cultivate land in the county. 1855 Elizabeth and George W. Scott laid out the town of Burleson, named for her father. The town was later renamed Lampasas, when it becomes the county seat. 1856 The Sixth Texas Legislature formed Lampasas County, named after the Lampasas River, from parts of Travis, Bell, and Coryell Counties. Burleson, renamed Lampasas, is made the county seat. 1858 The northeastern corner of Lampasas County became part of Hamilton County. 1859 The Lampasas Guards were organized to ward off Indian attacks. 1860 Lampasas County's population was 1,028. About 15 percent were slaves. 1861 Indian raids increased in Lampasas, as able-bodied men were off fighting in the war. 1872 Townsen’s Mill was built by Perry and Jasper Townsen. This steam mill cut "rawhide" lumber and ground wheat and corn. 1874 Henry A. Chadwick and son Milam built a sawmill, flour mill and cotton gin. 1875 The Farmers' Alliance was born in Lampasas in reaction against the cattle rustling and illegal land dealings prevalent in the county. 1882 The Gulf, Colorado and Santa Fe Railway extended its line west from Belton to Lampasas. 1885 The Texas Bankers Association, the oldest and largest in the United States, had its beginnings in Lampasas. 1887 Mills County received northern and northwestern sections of Lampasas County. 1892, April 20 – First state meeting of the Daughters of the Republic of Texas was held in Lampasas. 1902 Pierian Club of Lampasas, a civic women's organization, was chartered. 1920’s Texas Power and Light Company arrived in Lampasas County. 1934 The Lower Colorado River Authority brought electricity to the county. 1935 Rollins-Brook Hospital opened near Lampasas. 1942 Fort Hood opened as a military training base. Hancock Park in Lampasas was temporarily turned over to the troops as a recreational area. 1949 Lone Star Gas established services in the county. According to the U.S. Census Bureau, the county has a total area of 714 square miles (1,850 km2), of which 713 square miles (1,850 km2) is land and 1.1 square miles (2.8 km2) (0.2%) is water. As of the census of 2000, there were 17,762 people, 6,554 households, and 4,876 families residing in the county. The population density was 25 people per square mile (10/km²). There were 7,601 housing units at an average density of 11 per square mile (4/km²). The racial makeup of the county was 86.75% White, 3.10% Black or African American, 0.70% Native American, 0.75% Asian, 0.06% Pacific Islander, 6.49% from other races, and 2.15% from two or more races. About 15.07% of the population were Hispanic or Latino of any race. There were 6,554 households, of which 35.10% had children under the age of 18 living with them, 60.70% were married couples living together, 9.50% had a female householder with no husband present, and 25.60% were nonfamilies. About 21.90% of all households were made up of individuals and 10.50% had someone living alone who was 65 years of age or older. The average household size was 2.66 and the average family size was 3.08. In the county, the population was distributed as 27.60% under the age of 18, 7.70% from 18 to 24, 27.20% from 25 to 44, 23.00% from 45 to 64, and 14.50% who were 65 years of age or older. The median age was 37 years. For every 100 females, there were 96.30 males. For every 100 females age 18 and over, there were 93.30 males. The median income for a household in the county was $36,176, and the median income for a family was $41,395. Males had a median income of $30,320 versus $20,637 for females. The per capita income for the county was $17,184. About 10.70% of families and 14.10% of the population were below the poverty line, including 18.70% of those under age 18 and 14.80% of those age 65 or over. ^ a b c d e f g h i j Rhoades, Alice J. "Lampasas County". Handbook of Texas Online. Texas State Historical Association. Retrieved 29 November 2010. ^ Greene, A C (1998). Sketches from the Five States of Texas. TAMU Press. p. 18. ISBN 978-0-89096-853-6. ^ a b c d e Lampasas County Museum Foundation (2009). Lampasas County, TX. Arcadia Publishing. pp. 7–8. ISBN 978-0-7385-5881-3. ^ "John Patterson". Texas Historical Markers. William Nienke, Sam Morrow. Archived from the original on 18 July 2011. Retrieved 29 November 2010. ^ Anderson, Daniel; Yadon, Lawrence (2009). Ten Deadly Texans. Pelican Publishing. p. 105. ISBN 978-1-58980-599-6. ^ "Towsen's Mill". Texas Historical Markers. William Nienke, Sam Morrow. Archived from the original on 18 July 2011. Retrieved 29 November 2010. ^ "Chadwick's Mill". Texas Historical Markers. William Nienke, Sam Morrow. Archived from the original on 18 July 2011. Retrieved 29 November 2010. ^ "Pleasant Valley Farmers' Alliance No. 1". Texas Historical Markers. William Nienke, Sam Morrow. Archived from the original on 14 March 2012. Retrieved 29 November 2010. ^ "Gunfight at the Lampasas Saloon". Texas Historical Markers. William Nienke, Sam Morrow. Archived from the original on 18 July 2011. Retrieved 29 November 2010. ^ "Texas Bankers Association". Texas Historical Markers. William Nienke, Sam Morrow. Archived from the original on 18 July 2011. Retrieved 29 November 2010. ^ "Daughters of the Republic of Texas". Texas Historical Markers. William Nienke, Sam Morrow. Archived from the original on 18 July 2011. Retrieved 29 November 2010. ^ "Pierian Club of Lampasas". Texas Historical Markers. William Nienke, Sam Morrow. Archived from the original on 18 July 2011. Retrieved 29 November 2010. ^ Burnett, Jonathan (2008). Flash Floods in Texas. TAMU Press. pp. 162–172. ISBN 978-1-58544-590-5.